Hong Kong has had many well-publicized family business disputes in recent years. One such dispute involves a famous roast goose restaurant in the heart of the Central District called Yung Kee. The successful restaurant was founded in the 1930s by Kam Shui Fai, the family patriarch. His eldest son Kinsen helped run the business and another brother, Ronald, looked after property and other investments on behalf of the family. The critical point to note is that each brother had his own separate function and presumably, in cases of disputes, the father made the final decision and mediated. Following the death of the father, trust and communication broke down between the two brothers and some devastating litigation followed. It is not uncommon in Asia’s Confucian families that the business founder makes all major business ownership and family decisions by himself, and the family culture follows a “hub and spoke” model whereby the patriarch communicates one-on-one with each of his adult children, but not collectively. In a traditional Chinese family, there is both a natural hierarchy among siblings and at the same time an “equal inheritance rule,” where shares in the family business tend to be equally divided among (male) siblings. The question is, can the siblings develop the necessary collaborative skills to evolve into an effective sibling partnership once the patriarch is no longer in control? A variation of the hub and spoke model is the “one ship, one captain” model. Consider the case of a group of three siblings from a Hong Kong Chinese family. The family wealth was first developed by the father. Then each sibling, using family money and connections, developed their own independent business. Following the equal inheritance rule, each of these three businesses is owned in equal shares by the three siblings. As a matter of legal form, the sibling who runs a business is, in fact, a minority shareholder who can be removed and outvoted on issues by the other two non-managing siblings. Yet in terms of family dynamics, each sibling is the “captain of their own ship” who has never had to hold themselves accountable to their sibling shareholders. Each sibling has run their own business following the leadership model of their patriarchal father, making all decisions concerning their business on their own. Following the death or incapacity of the patriarch, some Asian families can evolve from this point to develop a “family board.” Families who can make this transition would say “in the first generation the family was led by the patriarch, in the second generation it is led by the family board.” A family board effectively refers to a “holding company level” in terms of decision making. If the three siblings in the example above can evolve to the family board model then this means they start viewing their commonly-owned businesses as a portfolio of assets being collectively controlled by the family board. 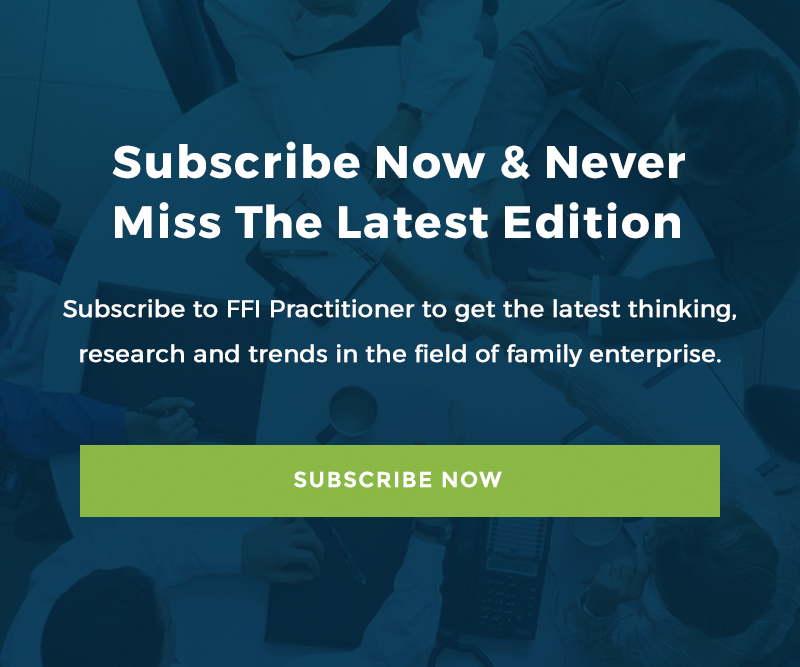 have the siblings discuss together (i) family communication patterns and (ii) flexibility within the family. The term “evolution” can been defined as the increase in the level of awareness. M. Scott Peck in his book A World Waiting to be Born, (which discusses civility in relationships and groups) describes four different levels of awareness, being awareness of: (i) self; (ii) the other, (iii) the group or system and (iv) the “ideal observer” perspective. Therefore, to help a group of siblings to evolve, the advisor role could also include helping to promote greater levels of awareness in each of these four areas. In terms of awareness of the group, there should be a realistic assessment of the quality of the relationship between the siblings and whether they have the capacity to develop collaborative skills. In a family meeting, one group of siblings in Hong Kong drew lines on a large sheet of paper between the names of each family member and then labeled each relationship as trending towards either (i) entropy; (ii) fission (conflict) or (iii) fusion (synergy) as a way to have an honest conversation about the overall trend of their family and their ability to be the future co-owners of a company together. Clearly not every family is going to have the awareness, collaborative skills, communication skills and the flexibility to move from the hub and spoke model to the family board model. Continuing with the example of three siblings and three businesses, another Hong Kong family tried moving from the “one ship one captain” model to the family board model following the death of the patriarch, but concluded that they could not learn how to make it work. This family restructured their shareholdings so that 90% of the shares in each business became held by the sibling who had developed the business. The other two siblings each held 5% to maintain a sense of family legacy and connection. This is a very sensible example of aligning the ownership structure of each asset with the reality of their relationships. This is therefore one alternative to the family board model. Octogenarian Li Ka Shing has long been at the top of the Forbes Billionaires list for Hong Kong. Li has “three sons.” The first two are his real flesh and blood children, Victor and Richard. His “third son” is the Li Ka Shing Foundation. In 2006 Li announced he planned to give away at least 1/3 of his wealth to the foundation for charitable purposes. Li said he would gift non-core assets to the foundation. Then in 2012, Li announced succession plans to pass ownership control of his core companies, Cheung Kong (Holdings) and conglomerate Hutchison Whampoa solely to his eldest son Victor. Li said he will give his younger son Richard, who controls the dominant Hong Kong telecoms company, PCCW, the money to invest in businesses “several times” more than the value of Richard’s current businesses. Ownership is to be clearly split but the family legacy can be preserved through the charitable foundation. By dividing ownership of his assets, Li has very smartly sidestepped issues about whether his two sons would have had the capacity to collaborate together. When an advisor is working with a family to help it plan for a transition, it is critical to start with an assessment of how the family members have traditionally worked together and whether the family has a hub and spoke culture of everyone reporting in to the patriarch. If the family does not already have experiences of siblings working together collaboratively then the advisor should not automatically push the family towards a shared governance model, or an ownership structure (such as a single holding trust) that assumes shared ownership can be made to work. Ivan Lansberg in his book, Succeeding Generations, describes a transition in terms of the family stakeholders exploring whether they can develop a shared dream for future shared ownership of the family business(es). Jay Hughes in his book, Family, the Compact Among Generations, says that the task for a group of siblings is whether they can, as a group of equal adults, develop a voluntary social compact together, where they can each see that a future of shared ownership offers the best chance for them to achieve his or her own personal dreams. If the family culture has been that of the “hub and spoke” model or the “one ship one captain” model, the exploration process among the siblings has to be grounded in that reality. If that is the case then consider whether there are any alternatives, such as Li Ka Shing’s approach of separate assets but a joint family foundation, or the compromise model described above, which might be more realistic than aiming for a full family board model. Advisors should always remember the principle that “form should follow function.” This means that legal forms and structures, including governance arrangements, need to be designed around the way that the family naturally functions. If siblings know how to collaborate together while the founder is alive then shifting to a family board model on his passing should be straightforward. If instead the family have a hub and spoke culture or have evolved into the one captain one ship model, then in this scenario the family board model is not an impossibility, yet it will clearly represent a significant change, the success of which cannot be assumed. Christian Stewart is the managing director of Hong Kong based consulting firm Family Legacy Asia (HK) Limited. He is also an associate of Milton, MA-based consultancy firm Wise Counsel Research Associates. Christian assists families around Asia with family governance and succession and he can be reached at [email protected]. The Contributor would like to thank Professor Kevin Au of the Chinese University of Hong Kong for reviewing this article. Family Business on the Couch by Kets de Vries, Carlock and Florent-Treacy which refers to the Circumplex Model. Bruce Lipton; The Biology of Belief. Family, The Compact Among Generations, by James E. Hughes Jr. Professor Joseph Fan, The Chinese University of Hong Kong.